Residents have begun occupying the latest phase of an exciting new mixed development of flats and townhouses in Glasgow by leading architects, Holmes Partnership. 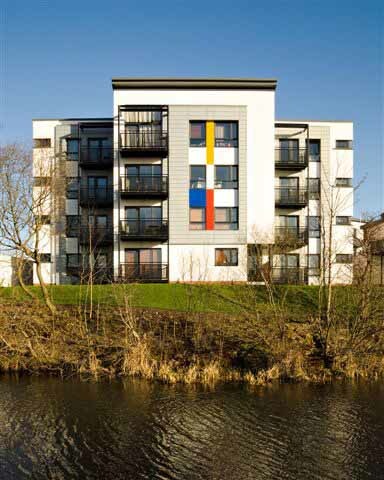 Located on a brownfield site on the banks of the Forth and Clyde Canal, the Mondriaan development consists of 4 storey flats, 2 storey flats and townhouses with associated private parking and amenity spaces. Borrowing influences from Borneo Island in Amsterdam, the Mondriaan development has been designed to echo the flow and contours of the canal. The townhouses are finished with raised timber deck terraces with free formed edges reflecting the articulation of the canal banks and site boundary. The central landscaped area comprises rolling grass mounds with a central hard surfacing route snaking through the space which creates a series of amenity, relaxation and contemplation spaces. ‘Mondriaan puts down a marker for a revitalised Ruchill on the Forth and Clyde Canal. 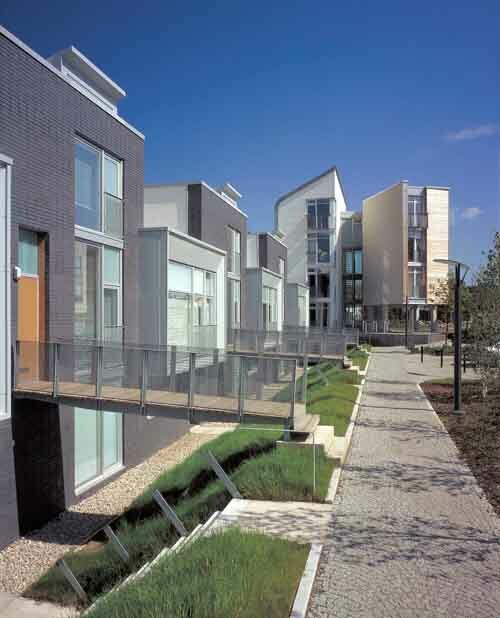 The individually coloured townhouse frontages speak of a new confidence in the area, and provide a suitable waterside response to the ambitious Millennium Project canal redevelopment’. The site is located on the disused McLellan Rubberworks situated on the banks of the Forth and Clyde Canal. It is bounded to the north by Shuna Street, to the east by Bilsland Drive and to the west by Ruchill Street. The site is brownfield and required extensive clearing to remove the existing heavily contaminated deposits. The site has a consistent gentle slope from north to south sloping down towards the canal banks from Shuna Street. There is a small cross fall from east to west. The unique locations together with the linear proportions of the site have assisted in developing a clear structured site layout. Along the north edge of the site, the development comprises four storey blocks of flats providing an urban edge fronting onto Shuna Street. In contrast, along the south edge fronting onto the canal, is a mixture of two storey flats and three storey townhouses. This linear approach enables the centre of the site to be planned with a central green landscaped area bounded and penetrated by the site access road providing access to recessed parking bays separated by raised beds of planting. The linear approach also enables a structured arrangement to be adopted in the elevational treatment to the flats and townhouses, which have a hard and soft façade respectively. Frontages onto the roads are principally finished with brickwork and penetrated with window openings as required. The south facades facing onto the central landscaped area and canal respectively have a softer finish utilising a mixed palette of materials, finishes and colours together with timber deck terraces and balconies. Holmes Partnership, a leading UK-based architectural practice with offices in Glasgow and Edinburgh, provides a full range of design, planning and consultancy services. Established in 1951 Holmes has built a reputation as a dynamic client-orientated practice, providing building solutions for public and private-sector clients. Large-scale projects in the residential, educational and commercial sectors now form the bulk of our current workload, with niche-sector, custodial, and masterplanning work making up the balance. In a recent market survey Holmes was identified as major supplier in the educational PPP sector. Glasgow and Edinburgh-based architects Holmes Partnership, took their whole office on a study trip to Copenhagen last month. After another successful year over 50 staff were rewarded with an inspiration-seeking 4-day tour of Denmark’s capital, taking in buildings such as HLT’s new Opera House, Schmidt, Hammer and Lasson’s Copenhagen Royal Library extension and MVRDV’s Gemini building. As a constant evolving practice Holmes looks for inspiration and new achievable design solutions from many countries. A previous trip to Amsterdam inspired their exciting new Mondriaan development along Glasgow’s canalside for client, Bellway Homes. With more than 50 years of experience Holmes has delivered successful projects in many sectors, including commercial, education, residential, custodial and PPP. In a recent market survey Holmes were identified as having the sixth largest involvement in the educational PPP sector amongst all UK practices. Progressive, well-resourced and client-orientated, Holmes Partnership has a strong track record of matching expectation with delivery. 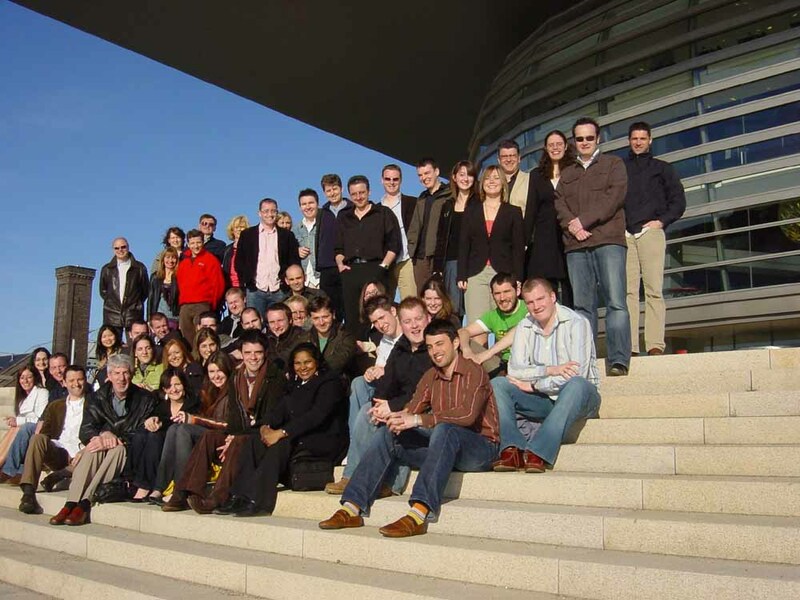 Earlier this year, Holmes exhibited at the UK architecture stand at MIPIM 2006, the world’s biggest property event, reinforcing the practice.s credentials as a leading player in UK architecture.